I have just completed a snorkeling and sightseeing tour for a Dutch family in Manokwari. 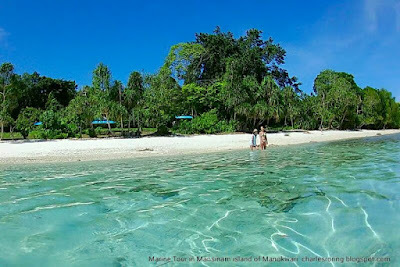 I guided them to see several parts of the city in the first day and then a tour to Mansinam island in the second day. The view of the coral reef could be seen easily. I brought my underwater action camera Brica B-Pro5 and some snorkeling gears that I ordered from an online store in China. Their brands were Whale. I was very surprised with the qualities of the products. The masks, snorkels and fins were very good. They were very comfortable on my face, mouth and feet. Whale is a very good brand for snorkeling and diving gear. When I was doing freediving, I could see a lot species of fish such as the Regal Angelfish (Pigoplites diacanthus), Latticed Butterflyfish (Chaetodon rafflesi), Backlip Butterflyfish (Chaetodon kleinii), Yellowtail Damsel (Neoglyphidodon nigroris), Dash-Dot Goatfish (Parupeneus barberinus). There were also grouper, moorish idol, surgeonfish, parrotfish, and anemonefish. 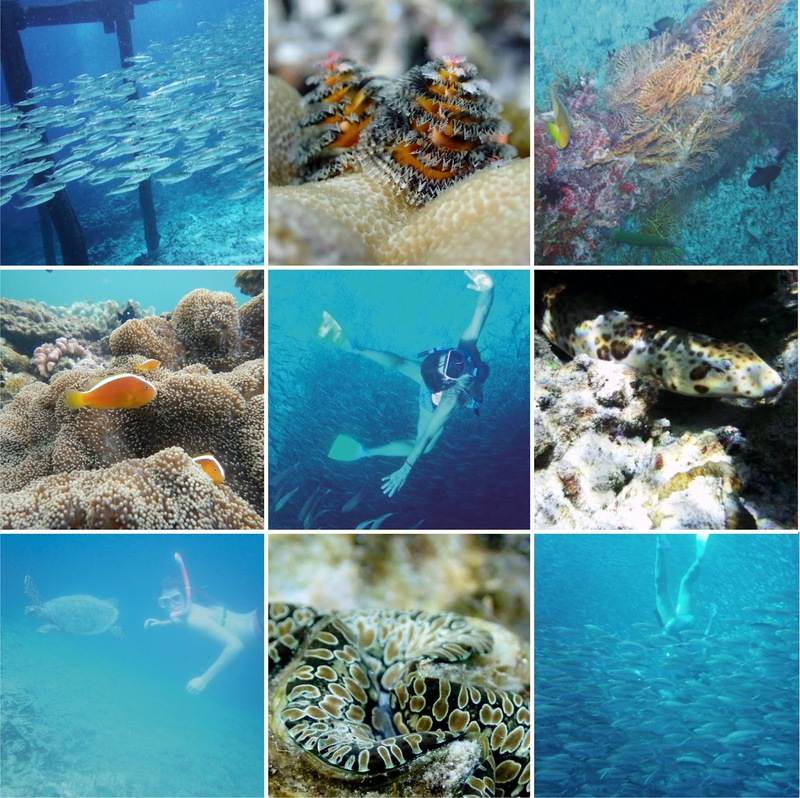 I felt as if I was diving in a giant aquarium with thousands of marine creatures around me. My experience of snorkeling and freediving was amazing. As a tourist guide, I often organize tours for foreign visitors who come from countries as far as the Netherlands, the United States, Japan, China, Korea, Germany, Switzerland, and India. I sometimes combine the marine tour with hiking, camping and wildlife watching tour in the rainforest. Visitors who are interested in taking a tour with me should bring their own snorkeling gear, and underwater camera as well as binoculars. Please, contact me (Charles Roring) by email to: peace4wp@gmail.com or whatsapp to: +6281332245180. It was one of those special times in life - a “pinch me” one that you always remember vividly and can count on fewer than ten fingers. I sat, quietly inhaling tropical hothouse smells in the high mountains of an untouched, unexplored, equatorial rainforest. I was waiting. Something spectacular was going to happen and it would have to be special indeed to dwarf the magic of the moment. I was in West Papua, in the Tambrauw region of the Birds Head Peninsular before dawn, and the jungle was waking with waves of haunting song, punctured by harsh screeches and cries from high up in the forest canopy, the helicopter wing-beats of hornbills flying overhead. Unfamiliar cries morphed into new calls as the later risers took their turn. Dark shapes of trees gradually gained detail, the changing light transforming them to every shade of green. Alien forms of ferns, palms, forest giants, vines, and ground dwellers, occupied every space in the rich scramble for life. Waves of unseen insects added their bizarre calls to the extraordinary abundance. We craned our necks upward trying to identify fleeting splashes of brilliant colour and as dawn really arrived, so did the Lesser Birds Of Paradise. Bursting out of the forest canopy in a spectacular halo of orange and gold with trailing feathers of pure white, backlit by shafts of light. They announced themselves with insistent “look at me” calls as they impatiently and rowdily took turns on the favoured branch with their acrobatic prancing, dancing, and shaking! Oh they definitely had our attention though the “girls” seemed somewhat less impressed. As my goose bumps subsided and I finally closed my mouth, it was impossible not to anthropomorphize as we watched the much less flamboyant but apparently “hot” chicks in their comical scrutiny of the boys. Our local guides were from the highland region of Fef and I watched them fade in and out of the trees with enviable stealth and silence, so much a part of the forest which we so obviously weren't. They added to a sense of the surreal, sitting there surrounded by alien song in an ancient forest with ancient people, watching a bird that elicited thoughts of anything but “lesser”. This wonderful experience was one of many and part of the second half of our two very different adventures. The first part, a snorkelling/diving trip to Raja Ampat was followed by a road trip into The Birds Head Peninsular, both of which commenced on the mainland of West Papua. Getting to this area isn't easy though! It requires a couple of flights from either Bali or Jakarta to the town of Sorong which is the largest port on the north western tip of the peninsular. This can't be done in a day but it's both the kick off point for boats venturing out to The Raja Ampat archipelago and the mainland excursions into the Birds Head Peninsular. The experiences I had in these places made the effort of getting there well worthwhile. My friend Sally and I had long wanted to visit the islands of Raja Ampat on a snorkelling and diving expedition. Our journey started with a boat trip from Sorong which took us out to Raja Ampat where we spent 10 days based on Kri Island at Sorido Eco Resort. It's an extraordinary archipelago, made up of four main island groups and located outside the “beak” on the Birds Head Peninsular of West Papua. In the clear unpolluted waters around Kri and the many uninhabited islands, the snorkelling or diving surpasses anything I have ever seen in my many years in the tropics. It's an increasingly rare privilege nowadays to put your head under the water and consistently see sights that are spectacular enough that make you momentarily forget you're not a fish! The rainbow colours and variety of corals - especially the soft corals, are rivalled by the fish, the diversity, and the sheer abundance. I've heard descriptions of fish soup but this was like snorkelling in seafood chowder! 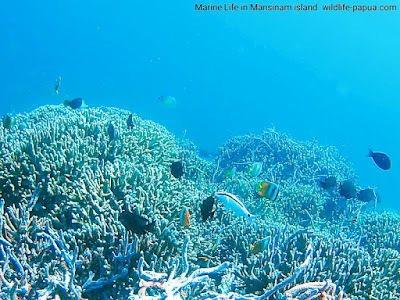 This abundance is due largely to the establishment of a network of huge marine protected areas and the uncompromising stance taken by the local population toward illegal commercial fishing, dynamiting, and cyanide poisoning. That goes hand in hand with educational programmes, employment opportunities for the local communities, and does not prevent the inhabitants from traditional fishing. Our time there filled me with optimism, hope, and joy to see how well it's working for them. Our little resort had a big social conscience. The owner and staff are actively involved in teaching skills to the locals, initiating sustainable projects, and establishing strong guidelines for its stakeholders. They make a huge effort to preserve the natural character of the area, are well organised and have a long history there. 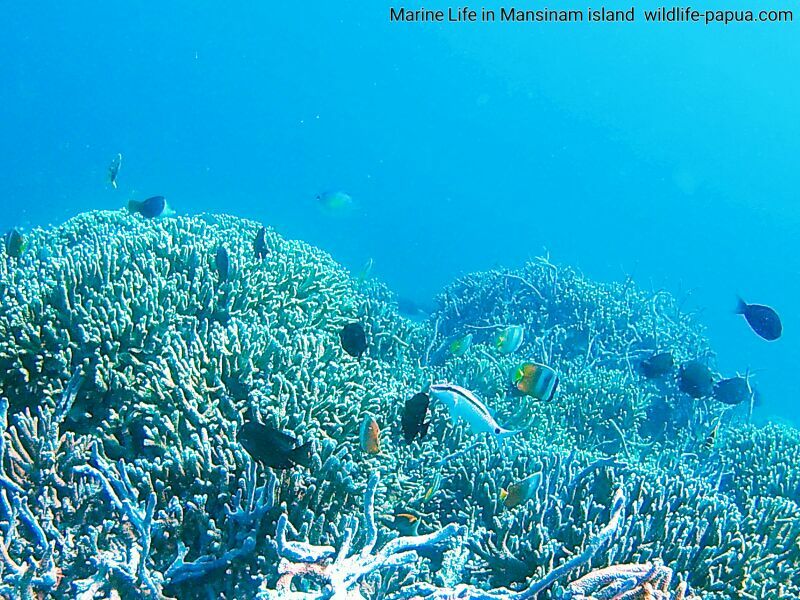 The underwater wonderland is rivalled by the abundance on land. One incredible snorkelling trip found us in a swift and narrow channel between islands with the rainforest canopy towering over us. By keeping our ears above water, we were treated to an avian symphony to accompany our effortless drift past a parade of aquatic treasures. That certainly challenged the senses! Above water included endemic birds, like the Red and Wilsons Bird Of Paradise and a huge variety of habitats which house such rich flora and fauna. No wonder Sir Alfred Wallace upon his visit in 1860, found the area so fascinating. Raja Ampat by no stretch of the imagination could be considered “touristy” though it has experienced an ever-increasing interest in the past few years, in spite of its remoteness and difficult access. While Raja Ampat was top of our list and provided the greatest motivation to make the journey to this remote area, we also had a quest to explore some part of the mainland with our remaining time. It was with great enthusiasm that we accepted an invitation to be part of an exploratory trip to the very north western tip of West Papua (formally known as Irian Jaya). This area, still virtually unexplored and untouched by tourism is known as The Tambrouw Regency and encompasses much of the northern coastline and hinterland into the high mountains of the Birds Head Peninsular. Strange coincidence perhaps that in addition to the strong resemblance the area has to a birds head, it also houses most of Papua's magnificent Birds Of Paradise, amongst a myriad exotic and beautiful rainforest birds, gob smacking butterflies, arrays of orchids, untouched rainforest, four species of nesting turtles, and so much more. The invitation for this second part of our adventure came after our email enquiry about trekking in the area. We got a response from Charles Roring, a West Papuan based tourist guide who not only said “yes” but by shear coincidence, the Tambrauw Regency was offering an assisted trip into their region in the hope of promoting eco tourism and raising awareness of the fabulous natural beauty and abundance. Seven of us set off with Charles and two Papuan guides. Apart from Sally and I, the other five comprised of two Bali based adventure travel operators, an American criminal lawyer, and a German couple whose IT business funded “off the beaten track” travel. Our journey began in Sorong, and almost immediately upon our return by boat from Raja Ampat we were met by Charles and three heavy duty 4 x 4's containing our fellow travellers. The trucks gave us our first clue as to the nature of our impending adventure. The roads here are not for the faint of heart or brittle of bone! After driving over some fairly challenging terrain which didn't include anything flat, straight, or smooth for about four hours, we mercifully arrived at the little coastal township of Sausapor, and the end of the road. The scenery was beautiful, hilly, dense lowland forest which ran down to palm fringed beaches and until the recent construction of the road, would have been devoid of human impact. Here we boarded a basic but surprisingly comfortable launch and spent a couple more hours cruising along the pristine coastline, its lush and hilly backdrop reminiscent of an equatorial version of West Coast South Island. On the way we saw dolphins, flying fish, sea eagles, and had a very close encounter with a large inter island ferry. Apparently it was necessary to slow down right beside us so the Indonesian passengers could get photos of this spectacle. Western tourists sitting on the foredeck of a flash launch was obviously not an everyday occurrence. Our Papuan crew acutely aware of this, enthusiastically joined in with this unique opportunity to have photos taken with the tourists. It left us with no choice but to smile which came pretty easily given the irony of the situation! Later that afternoon, having successfully negotiated a tricky shore landing further along the coast at Pasir Panjang, we were honoured to attend the local annual “Turtle Ceremony”. It was held in our hosts' village and was quite the occasion with traditional dancing, costumes, and guests from the region. After the ceremony and once it was fully dark, we were guided along the coast where some time later we stood on an incredibly remote and beautiful beach, with sugar white sand bathed in moonlight watching the Leatherback, Green, Hawkesbill, and Olive Ridley Turtles hauling themselves ashore to lay their eggs. Babies seethed out of the sand and made their mad dash to the ocean. We knew we were in one of those special places in the world where, because ocean currents, geographic location, and temperature have all lined up exactly, it has provided the perfect environment for the turtles to have bred for millennia on this equatorial coastline. Sadly, we also knew that their ability to continue to do so is incredibly threatened, in part by the devastating plastic borne here on the very same currents as the critical nutrients. We'd seen plastic bottles and polystyrene strewn along the coast, a violation of this untouched environment and a danger to its inhabitants.Conservation International is already there and doing its utmost to protect the turtles and educate the locals. We instigated a plastic clean up on the beach in front of the village where we were staying, and tried to reinforce just how very special their turtles and their corner of the world is. I was impressed by the far sightedness of local government and by the ability of many villagers to see the big picture and the importance of preserving their flora and fauna. They also realised the adverse consequences of allowing logging, and most importantly, understood that by promoting low- key eco tourism, much needed money could be injected into the local economies rather than money from logging or fishing. We were their guests of honour and they were gracious and welcoming. We felt honoured even if, on returning to the village exhausted from our night of turtle watching, we were to discover that they were completely enamoured of our air mattresses! Turned out that the beach, with it's little campfires, laughter, singing, and soft sand, was really the place to be anyway. I so hope our presence as the first of the Western tourists to visit this place will be remembered as positively by them as it is by me. From there we retraced our steps for part of the way, timing our departure in the wooden dugouts through the surf and back to the launch. We headed back to Sausapor and our waiting vehicles and after an hour or so, turned sharply inland and upward, quickly realising it was good to have had some pre- training in Papuan road travel. We traversed plank bridges over river gorges and assaulted slope gradients which I never thought possible! As we made our way upward the forest changed from dense to impenetrable, epiphytes and mists hanging around the protruding heads of the forest giants. Standing on the back of the truck clinging to the roll bars, we discovered a much better vantage point. It offered tantalising views from the ridge tops, green mountains and steamy valleys, wafts of perfume, brilliant parrots, and bird-wing butterflies. These images I'll have to keep in my mind - the idea of letting go with even one hand to take a photo, much less get it in focus, was quite out of the question! We were headed to Fef, the new capital of the Tambrauw regency and much like the road, just being developed. It's located on an area of flat highland plateau - the only one we saw in six hours of travel. It's also where we trekked into the rainforest to see the Lesser Birds of Paradise, swam in pristine rivers, listened to the stories of the old people and the laughter of the children, and were welcomed. Throughout this trip I was often left wondering how we westerners have managed to depart so far from our connection with our natural surroundings. Not so for the indigenous Papuans who have much to teach us in this regard. Their initial shy smiles quickly developed into real warmth and a genuine joy at our presence which was as special as it was unexpected, given the unrest this area has experienced. The Tambrauw Regency still has a chance and if we are at all concerned by the plight of the rain forests and marine ecosystems in an area which is considered to have the worlds richest biodiversity - both above and below water, we can do something We can choose to visit, support their economy, and support their efforts to retain the natural riches that until recently haven't been under threat. Ideally it will attract people for whom the experience is more important than the level of comfort. If you enjoy tramping in remote areas of New Zealand, possess a sense of humour, will happily embrace an evolving itinerary, and wish to make a difference - go to this area and find out for yourself. My time there has left me with an admiration for these people. They made me wonder how communities that have so little by our standards, can realise so fully that what they have got is precious beyond words, when with our benefit of science and education, we all too often don't even seem to rate such things. We haven't yet seen the Whale Sharks of Nabire or visited the highland bird-watching retreat in the Arfak mountains but I'm sure we will return. If you're planning to visit this magical place, I recommend you contact Charles Roring at peace4wp@gmail.com He is a great guide with formidable abilities to deal respectfully, positively, and humorously with the many and varied demands of this region. 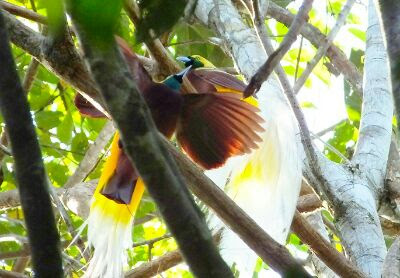 Lesser Birds of Paradise (Paradisaea minor) is an important bird species in West Papua. Its feather is used as head-dress in most traditional costumes of the indigenous Papuan people. Hunters kill the birds and sell them to wealthy city dwellers who put them as decoration in the living rooms of their houses. Although the population of paradise birds in the forest is still high, the number is shrinking rapidly because of logging, and conversion of forest into roads, as well as human settlements and farmlands. To support indigenous Papuan people in preserving their tropical rainforest, birds and wildlife, I introduce ecotourism in West Papua particularly in such regions as Tambrauw Mountains, Arfak mountains, Sorong regency and Raja Ampat. Although the title of the post is Lesser Paradise Birds, actually, visitors who take the birding and wildlife watching tour with me will see more. The duration of the tour is 3 days to 2 weeks depending on the number of places that visitors plan to visit. Other birds that visitors can watch include Twelve-wired Birds of Paradise, King Bird of Paradise, Magnificent Riflebird, Red-breasted Paradise Kingfisher, Palm Cockatoo, Sulphur-crested Cockatoo, Pinon Imperial Pigeon, Eclectus Parrot, Wompoo Fruit Dove, Azure Kingfisher, and a lot more. Visitors who want to take birding tour with me need to bring their own binoculars, and a D-SLR camera with telephoto lens. Please, contact me by email to: peace4wp@gmail.com or by whatsapp: +6281332245180. 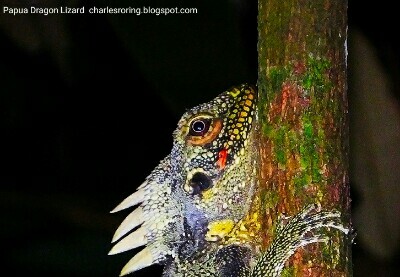 These are the photograph of Tree Dragon Lizard that I saw in Susnguakti forest when I guided 2 Dutch tourists on a 4-day/ 3-night hiking and birding tour in Manokwari. The forest is located in the eastern region of Arfak mountains approximately one and a half hour ride from Manokwari. I have organized numerous tours to the forest for visitors who come from Poland, the United States, Australia, Germany, The Philipines, South Korea, France, Spain, and Indonesia. Susnguakti forest is the natural habitat of birds such as Lesser Birds of Paradise, King Bird of Paradise, Magnificent Riflebird, Spot-winged Monarch, Rufous-bellied Kookaburra, Hooded Butcherbird, Great Cuckoo Dove and a lot of other species of birds that are endemic to Arfak mountains. In addition to birds, tourists who go there could also see cuscus possum, and bandicoot, ground brown skink, and snakes when doing night walk in the jungle. Fireflies and glowing mushrooms exist in the jungle. There are no hotels or guesthouses in the jungle. I and local villagers built basecamps in the forest for tourists who want to spend a few days exploring the wealth of biodiversity of the forest. If you are interested in visiting Susnguakti forest, please, fly from your country to Jakarta city - the capital of Indonesia. After that, you can take a domestic flight to Manokwari by Garuda, Sriwijaya Air or Batik Air. Don't forget to bring binoculars, spotting scope, head torch, field guide book: Birds of New Guinea. This is my email: peace4wp@gmail.com and whatsapp: +6281332245180.